So let's get the train rolling! Who is hyped? Personally, I love the look of the game and the goal the devs are trying to achieve. Here's hoping it won't get delayed. Game of E3 for me together with The Witcher 3. Gorgeous, gorgeous. I love the art-style as much as Wind Waker's. Link totally looks like a girl... whether he is or not, I don't really mind either way. I do hope there's some new environments, though! Looks beautiful. I'm guessing the bow is going to be important. The arrow looks pretty intricate. And Link has a visible quiver which I don't think the series has done before. I don't think they're going to remove the sword completely but maybe it suggests the bow itself could be the new important weapon while the sword is a sub-weapon. And yeah Link does look especially effeminate. Maybe they were trying to make him look younger. Also, generic horse. Not Epona. Interesting. This kind of reminds me of Shadow of the Colossus for some reason. Love it! And that Link is totally hot. He's not a girl, he just has a slight ponytail. Men can have ponytails. Link's always looked a bit femenine anyway, that's why female cosplayers pull him off so well. Priorities out of the way ( ) this is going to be so gorgeous. According to a Nintendo rep that trailer was all made from the in-game engine too. I'm digging this art style a lot, it's like Skyward Sword crossed with a hint of Wind Waker, though I'm noticing the latter more in Link himself than the enviroment. His shirt is the same as his Wind Waker clothes and his face, and especially his eyes have a softened Wind Waker feel. Thats what Im most excited about! The game really looks viewtiful, the environment looks too good and I like Girl Link. Pretty weird that he is not wearing a green tunic, huh? BTW, Link totally stole Big Boss ponytail and open worldness. @Tiggu: It wasn't just the ponytail that made me think girl... he has an hourglass figure (or relatively wide hips anyway), slim yet curvy arms and a strong blush on the face. If you add those up... anyway the consensus seems to be it's still a guy. And yeah the lack of sword is pretty noticeable... Aonuma did mention co-op gameplay before. Maybe there will be 2 Links, one with sword and one without? Or Zelda will join in? Man, I adore the cell-shaded anime visual look of the character. I didn't even notice the pony tail. Usually I hate pony tails on male characters but it doesn't look too bad here. 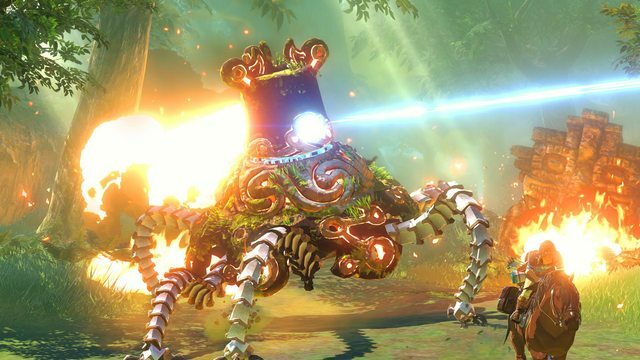 What do you think the odds are we get to customize Link's attire this time around? Would be pretty cool. And no Zelda trailer has shown Link in his start up clothes. At least I don't think. That's cool, I really think this will be a part of the co-op thing they talked about. A Link with a sword, and another character (male or female) with a bow. Control this character with the gamepad, control Link with WM+...? One can only hope. That's what I'm thinking now too. Maybe Link's twin sister. Hey, maybe you play as Link and Tetra s kids! Apparently people have spotted a sword on the horse, so there's that. I wonder if shooting bow and arrow is really better/faster with gamepad than with WM+. Can anyone who played NintendoLand confirm? I'm kinda curious if Nintendo will go with DLC on this one. They're slowly embracing DLC for their big games. This could help extending the game's lifespan especially since its open world like Skyrim. You had to use the gamepad in NintendoLand to shoot arrows but it felt just as accurate as the Wii remote in Twilight Princess. Man Zelda games take so long to create. The game looks beautiful and the world looks really big. I mostly love the fact that it focuses on exploration and freedom. I am not thrilled about Link's design (if he is Link). He looks like a girl. I know Anuma said something like "who said he is Link? ", but I don't believe him much since years ago, before Twilight Princess was released, I remember someone from the press refer to Link's horse as Epona and Miyamoto said something like "who said this horse is Epona? ".